Even though I had huge respect for his athletic ability and enjoyed watching him use that athleticism wisely and evolve into a unique, and effective Quaterback in the NFL; I was never a Vick fan. Not for his alleged misgivings as a team mate. 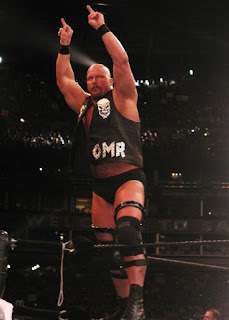 Not for giving fans the "Stone Cold Salute" with cameras trained on the future "Dogman of Alcatraz". Not for his one and done trip to the playoffs. No for one simple reason: He was never a Raider QB! So for I just enjoyed the on the field performance of one of the most gifted athletes of our time but never a "GAGA" moment as a fan. That was until now. After the expected but ridiculous showing today by PETA and their ilk at Eagles training camp, Count Nate Lewis as the newest "DVF" "Defiant Vick Fan". I now wish nothing but championship success for my "boi" although he could only prove this on the field towards the second half of the season. PETA your 'doodoo el grande' scheme of sensationalizing hate will backfire again. To get a bit off of the subject, hats off to the Humane Society for extending a forgiving PR hand to Vick to intelligently and rationally work to raise awareness and possibly move towards curbing dogfighting worldwide. Now back to the PETA punks! OOps sorry if I went a little Ghetto on ya! For your own safety please keep your signs and shouts a safe distance from Lincoln Financial Field. How about Santa Barbara! If there is one group of fans that you fresh faced PETA peeps should keep your distance from is Philly fans. They love and hate their Eagles and they wil extend that same love or hate to their QB's after their second interception, not their criminal record. But to you, well you become enough of a distraction to Joey, Boots, and Skeeter, You might find those signs stuffed where very few will see them if you catch my drift. Now let me make this clear, I have loved and cared for many animals in my life and I find Michael Vicks former activities just as horrible as you do. But by the laws of this country he has served his time. I try to live by Christian values and I bet some of you misguided PETA foolshnanigans do as well. Every hear of forgive? Look it up. You have the right to protest in this the most free of countries. This is just an opinion, but you have turned Michael Vick into the Underdog (excuse the pun) and there is nothing more appealing to the Amercan psyche than rallying around the one whose the odds are stacked against. 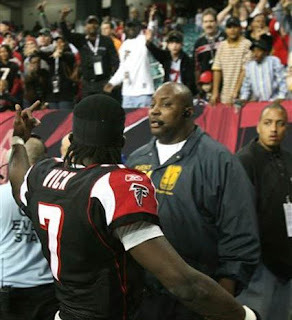 So Michael Vick go ahead 'boi'. I look forward to the first time that you cross the goal line or an Eagle receiver catches one of your somewhat accurate passes for 6. Once you do in the mind of the football psyche, all is forgiven.